The Vincent D. Nickerson Collection consists of original perspective drawings, many in color, prepared to provide the details needed for the paintings Nickerson was commissioned to produce. 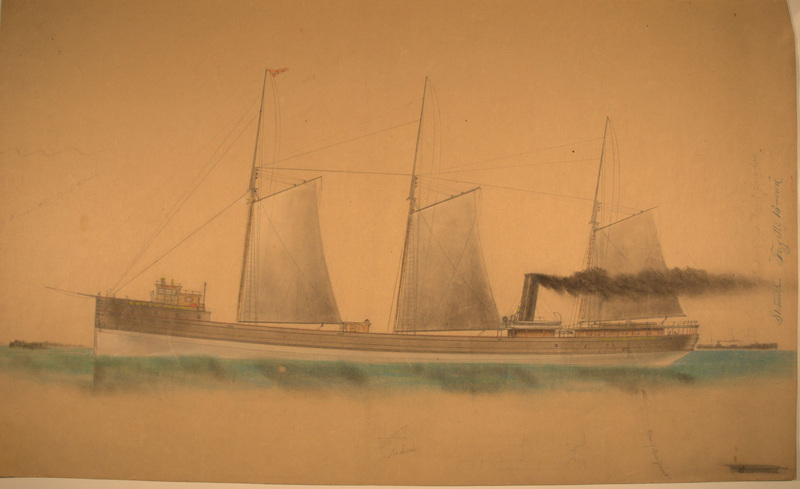 These drawings often provide scale drawings as well as color schemes of Great Lakes vessels from the 1840’s to 1910. In many cases his drawings are the only known details available for a particular vessel. Only a small number of Nickerson’s finished paintings survive, adding more significance to this collection. This exhibit includes fifty-two of the more than three hundred original vessel drawings in the Nickerson Collection dating from 1880 to circa 1910. The Nickerson Collection is one of the most, if not the most, extensive body of work of a Great Lakes marine artist in a public institution. The Vincent D. Nickerson Collection was donated to the Historical Collections of the Great Lakes/CAC by Ellen Drouillard Boruff of Bloomington, IN on June 22, 2011. All rights in the collection belong to Bowling Green State University. The Vincent D. Nickerson Collection exhibit is part of the Digital Gallery at BGSU.